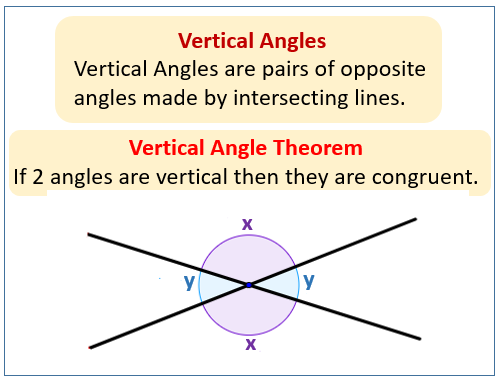 When two lines intersect, the opposite angles form vertical angles or vertically opposite angles. They are called vertical angles because they share the same vertex. Notice also that x and y are supplementary angles i.e. their sum is 180°. The following diagram shows the vertical angles formed from two intersecting lines. Scroll down the page for more examples and solutions. 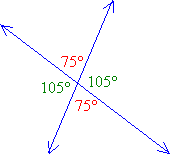 The following diagram shows another example of vertical angles. The following video explains more about vertical angles. How to define and identify vertical angles? A group of examples that identifies vertical angles. Given the diagram below, determine the values of the angles x, y and z. Both AEC and DEB are straight lines. Find q. The following video shows how to use the vertical angle theorem to solve problems. Identify vertical angles and find the missing angle measures from a diagram. The following video shows how to find a missing vertical angle in a triangle. The following videos will prove that vertical angles are equal.